Cats: feed them, love them, take them to the veterinarian. But when was the last time you thought about whether your cat is happy? Jane Brunt, DVM, Executive Director of the CATalyst Council says one of the keys to keeping cats healthy is keeping them happy. “Studies show that happy cats are healthier cats, and healthy cats are happier cats,” she says. That’s why, for the seventh consecutive year, the CATalyst Council has declared September as Happy Cat Month: a time to promote feline wellness by highlighting the link between feline happiness and health, and to encourage actions and activities that support happy — and healthy — cats. If a stressed cat is an unhealthy cat, then a happy cat is more likely to be a healthy one. What can cat owners do to make their cats not only less stressed, but more happy? “Cats climb trees for two reasons: to survey their territory as hunters, and to escape as prey,” says Buffington. Give your cat access to high places in your home. This can range from expensive store-bought cat trees to simply clearing the top of a bookshelf for easy feline access. 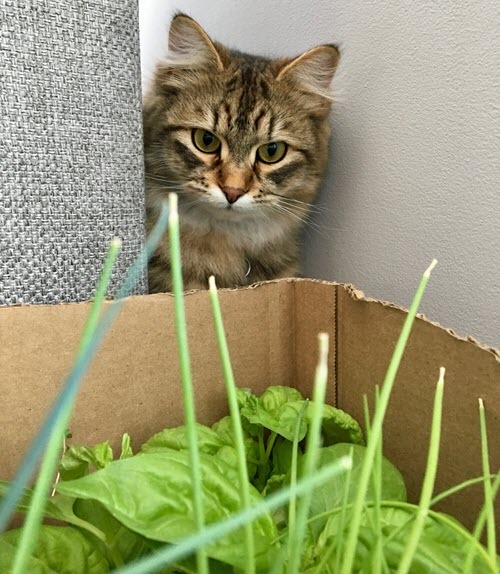 Some cats prefer to hide lower to the ground — under the bed, behind the sofa, or in a closet; make sure your home has some high and low places, so your cat can find the safe refuge he or she requires. “Cats are fastidious creatures,” says Brunt. “Inside our homes, we want them to use litter boxes, but we need to do our part by emptying them at least once or twice a day.” It’s also important to ensure that access to litter boxes cannot be blocked by other cats, or at least to provide alternative locations. Experts recommend at least one litter box on each level of a home, or one more than the number of cats in the house. For more information and tips about ways to enrich your cat’s life, follow @CATalystCouncil or the hashtag #HappyCatMonth on Twitter and Facebook throughout September. FCVC wants you to have a healthy, happy cat! We think that preventive care is the best path for keeping your kitty happy. Preventive checkups can catch things that you might not see until the problem is much more advanced. If your favorite feline has not had a checkup recently – we have appointments available. Call us at 970-587-5140 to get your appointment. We love to see our feline friends!